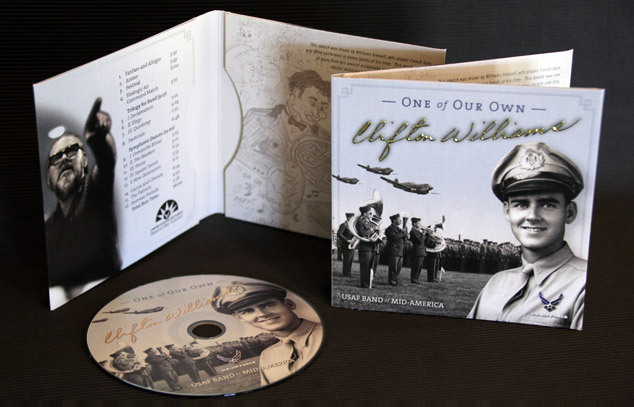 A while back, Visual Lure was contracted by the United States Air Force Band of Mid-America (stationed at Scott Air Force Base) to design CD packaging for a new album dedicated to Clifton Williams, a famous composer and Air Force veteran. The CDs turned out beautiful and we finally got around to photographing them. They were printed on a nice textured uncoated card stock with Clifton’s signature embossed and foil stamped on the cover. 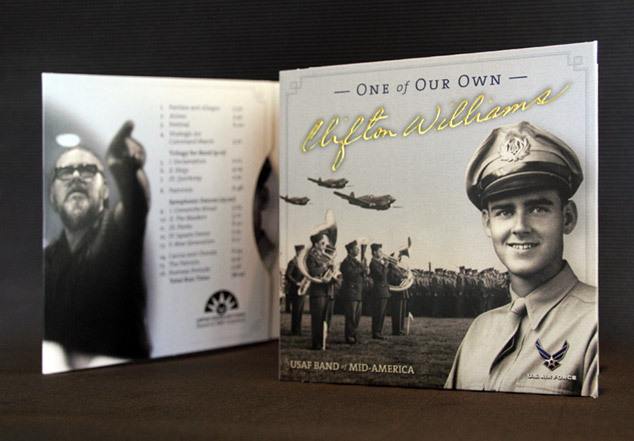 The cover design features Clifton’s signature, a collage made from three different images and a subtle classic border. The inside covers have an additional photograph of Clifton along with some of his sketches and doodles. The initial goal was to create packaging that felt vintage, and classy, and we think we succeeded at both. If you are looking for quality packaging design, whether you’re in the St. Louis, MO, the St. Louis Metro East or anywhere else in the country, contact us today!